When food meets design, you get Redpan, a relatively new restaurant which has opened at Marina Square. Located in the new wing of the mall, the decor of the place is like an upmarket bistro. The restaurant is well-lit and the furnishings are designed in a way that they stand out. The menu focuses on giving Western food a Singaporean twist, throwing a spotlight on local ingredients and familiar flavours. If made well, a soup serves as a great way to begin any meal. Hence, we right away ordered the ‘Smokey Tomato Soup’ which turned out to be a satisfying dish. The tomato soup served with garlic croutons had an additional depth to it due to the chargrilled effect. For the mains, we ordered the ‘Vegetable Lasagna’ for a wholesome dish. The dish was a colorful medley of vegetables like baked pumpkin, grilled eggplant and mushrooms along with tomato sauce and curry bechamel. Going meatless does not mean giving up on flavour and this dish proved its point with its great taste. Highly recommended. One of my go-to pasta dishes to order is the ‘Roasted Vegetable Aglio Olio’ because its a toss and serve kind of dish that spells comfort. 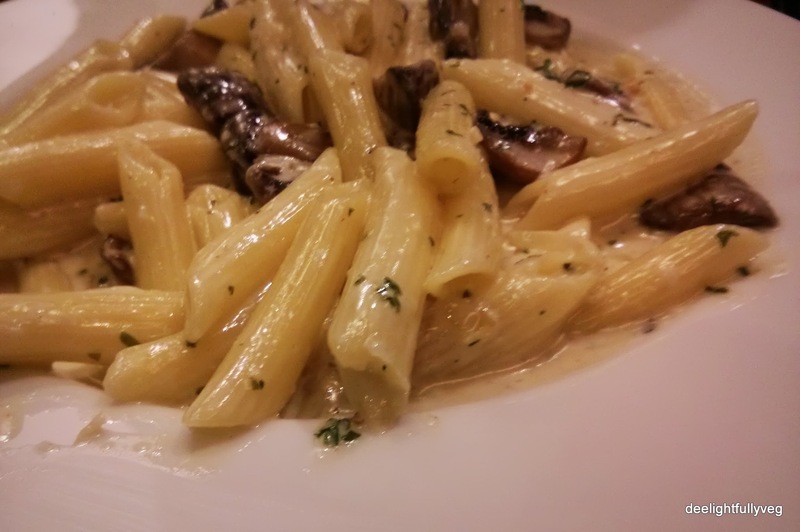 This pasta at Redpan could have been better, both in terms of taste and seasoning. 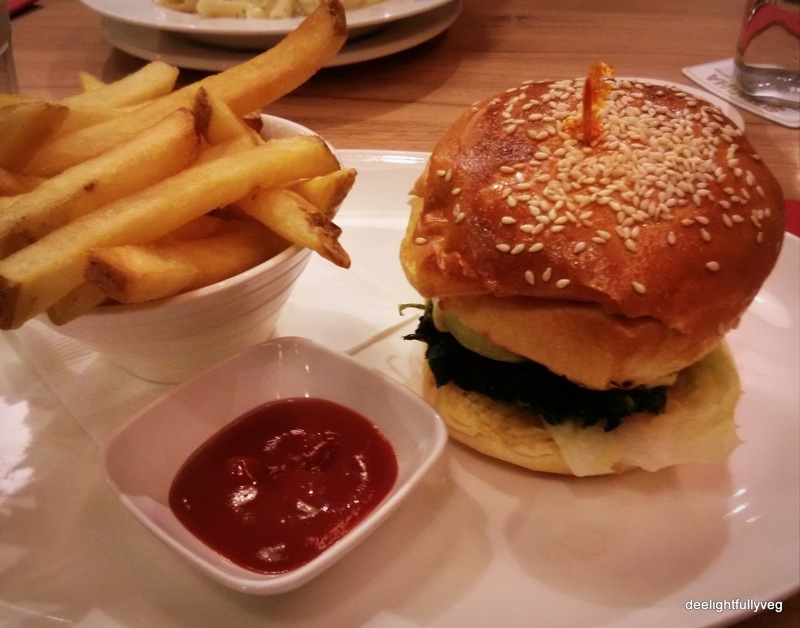 It is never surprising to see a ‘Portobello Mushroom Burger’ being offered as the sole vegetarian burger option in many restaurants across Singapore. I have always maintained that there should be more varieties tried in this segment for sure. Having said that, the size of a grilled portobello perfectly fits the size of a burger bun and is liked by mushroom lovers. Here, it was served with cheddar and lettuce in toasted ciabatta buns and was a solid rendition of the dish. The fries on the side were addictive! 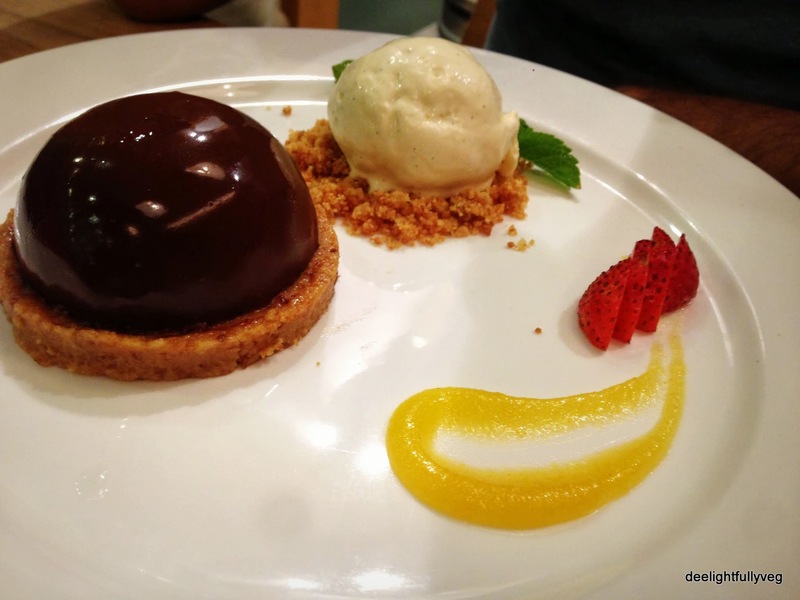 The desserts at this place really impressed me and the variety is mindboggling – they have the dessert options listed on the menu and the daily specials displayed on their cake counter. To begin, we ordered the most unique ‘Teh Halia Creme Brulee’ which was a classic dessert infused with ginger and tea. As weird as it sounds to imagine tea in a dessert, this offering incorporating the local milk tea is top-notch as the ginger subtly cuts through the dish and keeps the sweetness of the dessert intact. Highly recommended. The restaurant nailed it again with yet another impressive creation in the form of ‘Red Date Butter Cake’ which was fragrant and rich. A delicious scoop of vanilla ice cream mounted on a butter cake that rested on a bed of sticky local red dates and caramel sauce was a tempting sight. Worth trying for enjoying a different creation using local flavours. If you are looking for cake options, then try the Red Velvet Cake and the Dark Chocolate cake which disappeared from the table in no time. But if you are looking for a refreshing concoction then ‘Roselle Sour Plum Soda’ acts as a perfect match to a delicious meal. Considering the overall experience of the meal, the prices at Redpan are very reasonable. For its ambiance, for its experimentation in food offerings and for its exquisite desserts, Redpan is definitely worth a visit! Paper Crane is exactly one of those cafes that you would chance upon while roaming. A sign stating ‘Want Hearty Meals for $10?’ set in a vibrant design was what caught my attention – even on a rainy evening. Tucked away on Waterloo Street in the Singapore Council of Women’s Organisations (SCWO) building, this is a fuss-free cafe offering simple food. Their menu is neatly written on a chalkboard and they keep changing it frequently. For vegetarians, the options are limited and hence it is better to inquire before you travel specifically to this place. If you are in the area, you can surely drop by to check the menu and their daily specials. I am pretty sure they can make a basic vegetarian pasta on request. Our alfresco seating was perfect (even with rains) as the cafe is well-shielded. With limited veg options, it’s always safe to go for the Pasta. The ‘Spaghetti Arrabbiatta’ was a delightful experience with the sauce evenly coated across the pasta strands. The olives and capers provided the necessary bite and this turned out to be a decent dish. The regular readers of my blog would know by now that I consider it as a welcome sign when a cafe attempts a non-mushroom burger in the vegetarian section. The same thought made me order the ‘Falafel Burger with Fries’ with a lot of anticipation. Unfortunately, I was let down by the dryness of the chickpea burger which had the texture of a frozen patty. But it was heartening to see that the owners took the feedback in a constructive manner and I hope to try it again sometime 🙂 The fries on the side were a good munch. During rains, its thrilling to get a ice rush in the form of slushies which are ideal summer time treats. I ordered the ‘Watermelon Slushie’ filled with ice and this turned out to be a good slow sipping drink. The cafe has a small dessert counter with few options. We tried the ‘Carrot Cake’ and ‘Baklava’ which were strictly passable. Nothing much to write about on these offerings except that the prices were reasonable. On the whole, the dishes are friendly on the wallet and the service is extremely friendly. Pay them a visit if you are in the area! Think of a conveniently located cafe with a nice bustling feel to it. Roosevelt’s Diner and Bar situated conveniently above Outram Park MRT fits that description perfectly. Whether it be a weekend brunch or a dinner, this cafe has it all in terms of food and drinks. It has an NYC style industrial chic decor filled with warm lights. If you are looking to chill with some laid back and casual vibes, then this cafe fits the bill. If you are used to authentic Western food, then you will immediately assess that the menu had it all. Personally, I was happy to see a vegetarian burger that was not a Portobello Burger. There were a variety of options in drinks, starters, desserts and milkshakes, so in that sense you will be spoiled for choice. I am always happy if a cafe tries to offer a non-mushroom burger in their menu and hence I ordered the ‘Deep Fried Vegetarian Burger’ which was a neatly stacked layer of vegetables, coated in breadcrumbs and fried. It contained red bell peppers, tomatoes, onions and lettuce and was served along with a bunch of french fries. The burger was quite delicious but it was a bit crumbly, so you have to be a bit careful while biting to it – otherwise it can get messy. The other main for the night was the Roasted Veggie Aglio Olio. I was happy to see that this was a more substantial plate of pasta as it incorporated vegetables. Normally, this pasta features only mushrooms. The vegetables were well roasted and seasoned. Overall, a good dish. Since Singapore is pretty humid, its important to nail summertime desserts. And the ‘Roosevelt’s Salted Caramel Milkshake’ totally lives up to expectations. The evening light cannot do justice to the picture. It’s not loaded with ice and actually malted well to create real volume, this milkshake is totally recommended. For the variety in the menu, for casual vibes and attentive staff, Roosevelt is worth a visit for basic Western comfort food done well. Once in a while, one wants to dine by the riverside and that took me to Sque Rotisserie and Alehouse situated in Clarke Quay. They were celebrating their second anniversary and have expanded their seating to two blocks facing the river now. The atmosphere is very casual and lively and it’s ideal for dinner. We were attended to by friendly staff almost immediately. We first ordered ‘Portobello Burger’ and the dish did not disappoint in serving size or taste. The fries we ordered as sides were hot and crunchy and served as a good complement to the mains. The pasta order was placed by me and I tried the ‘Penne Alfredo’ which was a little bland and the pasta was slightly under cooked. This was the only dish in our order that did not stand up to the mark compared to the other items. But what sealed the deal were the desserts. There are quite a few options on their dessert menu and we were confused on what to order. 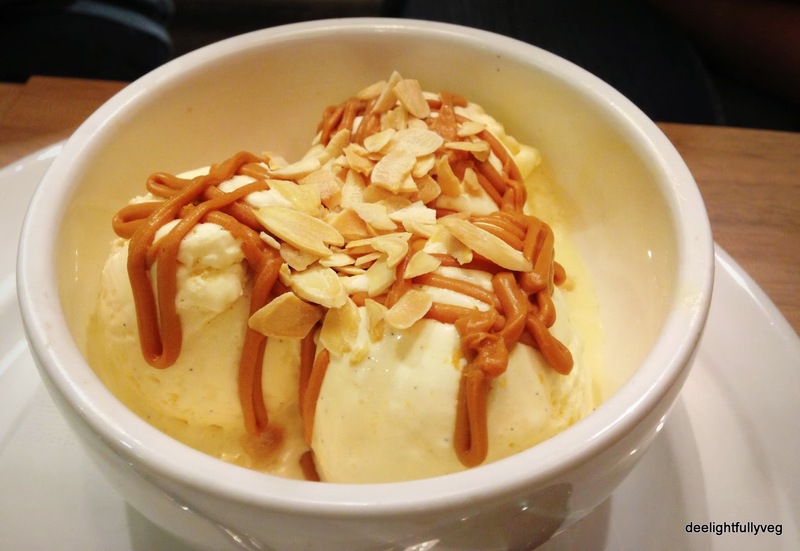 First, we decided to try their specialty ‘Sque Sundae’ which was sheer pleasure for the taste buds. Three large scoops of ice cream perfect to dig into – and we exactly ended up doing that. Then we went for the ‘Belgian Chocolate Mousse’ which was a visual delight. The pic below would be self-explanatory. The mousse melted in the mouth and was rich without being cloying. Each of the desserts is a sizable portion (enough for 2 people). The usual ‘Tiramisu’ was also delicious.At the end of the dessert, one is definitely left longing for more. The place is also known for its ‘happy hours’ which occur at set times and have 1-on-1 promotions. Casual conversations, lively atmosphere, good service – the restaurant acts as the perfect combination for unwinding with friends.